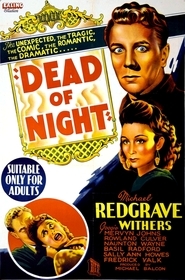 Ealing Studios' 1945 production of Dead of Night is a landmark film on two different levels. Its overall high quality, mind-bending wraparound story, and one legendary sequence solidify Dead of Night's reputation as one of the greatest examples of the horror anthology. Of equal significance, the film provides links to the future by introducing elements that foreshadow genre movies made many years later. Architect Walter Craig (Mervyn Johns) is summoned to consult on a remodeling job on Elliot Foley's English country home. From the moment Foley's house comes into view Craig begins to feel ill at ease. This feeling intensifies when Craig, entering the house for the first time, begins to remember things about its layout. The déjà vu escalates further when, upon meeting Foley's assembled house guests, Craig reveals that they are all characters in his recurring dream. Rather than dismissing him, the guests, with the exception of psychiatrist Dr. Von Straaten (Frederick Valk), are warmly sympathetic to his story. They take turns recalling brushes with the supernatural they have experienced in their own lives. Things turn ominous as Craig begins to recall additional pieces of his dream and claims that it will become a "nightmare of horror". One of the things that make Dead of Night watchable even after 65 years is the decision to make the framing device, Craig's dream, more important than the individual anecdotes. Director Basil Dearden establishes a repeating narrative pattern that moves the film along while drawing the viewer ever deeper into the mystery unfolding in Foley's living room. One of the guests tells a story, after which Dr. Von Straaten offers a scientific explanation that everyone rejects. Then Craig reveals a bit more of his dream. With the exception of an intentionally comic episode each story gets progressively darker in tone. This mirrors Craig's growing anxiety that he is ultimately heading toward a terrible end. The first story, "The Hearse Driver", is told by Hugh Grainger (Anthony Baird). In it he describes a strange apparition of a horse drawn hearse he experienced while hospitalized after a serious race car accident. Is it a fever dream caused by his injury or is it a warning? As directed by Dearden, "The Hearse Driver" is a minimalist tone setter for the tales to follow. The apparition sequence is set up beautifully. At 9:45 PM the nurse has just left for the night. It is a warm summer evening; a romantic ballad plays from a radio. Moments later Hugh glances from his book and as everything goes silent he sees that the clock now reads 4:15. As Hugh rises from his bed the lighting changes and he casts a huge, menacing shadow on the drawn curtains. He parts them to reveal that it is broad daylight outside the hospital. The camera zooms in on the hearse driver who says, "Just room for one inside, sir." Shaken, Hugh slowly goes back to bed where in a few moments the music returns and the clock now reads 9:50. The rest of the story zips to the pay off with admirable economy, the entire episode lasting only about six minutes. Next up is teenager Sally O'Hara (Sally Ann Howes), who shares a story called the "The Christmas Party". The setting is a holiday gathering at a vast old mansion with rumors of a haunted past. While wandering through the attic she discovers a passageway and follows the sound of crying to the bedroom of a young boy named Francis Kent. Sally consoles him, tucks him into bed with a lullaby, and returns to the other guests. When she reveals the boy's name she discovers the shocking meaning of her encounter. The effect of this story is the weakest of the non-comic installments. Director Alberto Cavalcanti mounts a stylish presentation. When Sally is alone upstairs his expressionistic use of light and shadow create a dark contrast to the festivities below. But this is a case where the story is underdeveloped. There is nothing to the plot beyond resolving whether the mansion is haunted. It is a case where less is well, less. The third tale, "The Haunted Mirror", is related by Joan Cortland (Googie Withers). She buys her fiancé Peter (Ralph Michael) an antique mirror shortly before their wedding day. He hangs it in his apartment and soon begins seeing in it a completely different bedroom than his own. He begins to question his sanity, as he alone is having this experience. He also believes the mirror is trying to "claim" him. While Joan is on a short trip, the mirror takes total possession of Peter. He assumes the personality of its mad former owner. When Joan returns home she finds that she must fight, not only for her husband, but for her own life. First time director Robert Hamer does a terrific job of keeping the rather wild premise believable and the tension building right through to the climax. This story advances the very modern idea that, although the threat to Peter is supernatural, the real horror lies in the possible loss of self, of our identity being subsumed from the outside. This concept would be explored repeatedly in 1950's Sci-fi/Horror where aliens substitute for malevolent spirits. It is difficult to know why the filmmakers included the fourth anecdote, "The Golfer's Story". As the stories were becoming progressively more intense perhaps they wanted to give the audience a break before the even tougher sledding yet to come. Whatever the reason, injecting a comic interlude seems jarringly out of place. As told by Foley, Larry and George (Naunton Wayne and Basil Radford) are good friends who resolve a romantic rivalry with a round of golf. Larry loses and drowns himself at the 18th hole only to come back to haunt George, who cheated on his score. The fact that Larry must always stay within six feet of his victim presents a problem for the consummation of George's pending marriage. As George puts it, "Because a chap becomes a ghost it surely doesn't mean that he ceases to be a gentleman." "The Golfer's Story" has a mildly risqué charm. It just should have been in a different movie. The final story is offered by Dr. Von Straaten. In "The Ventriloquist Dummy" he consults with the police regarding the shooting by Maxwell Frere of Sylvester Kee (Hartley Power). Both men are ventriloquists and Frere attacked Kee because he believed that Kee had stolen his dummy, Hugo Fitch. In what amounts to a flashback within a flashback we see an enactment of Kee's story from the police report. When he catches Frere and Hugo in a nightclub performance for the first time we get a full dose of an act that is equal parts show biz and psychodrama. Frere is sincere but tentative while Hugo is abrasively self-assured. Their "interplay" on stage creates such a sense of unease that it is difficult to watch. Cavalcanti brilliantly keeps us off-balance. Everything in the movie up to this point suggests that by some supernatural means Hugo will be somehow alive. The director fosters our perception of Frere as a put-upon victim. This distracts us from the much darker direction the story will take. MULTIPLE SPOILER ALERTS FOR THE REST OF THIS REVIEW! The element that raises "The Ventriloquist Dummy" to greatness is the transcendent performance by Michael Redgrave as Max Frere. He captures our empathy even while disintegrating before our eyes. A moment during their performance when he snaps, slapping Hugo in the face, is still shocking. The way he clutches at Hugo as he shoots Kee while Cavalcanti spins the frame is unnerving. When Von Straaten, playing a hunch, slips Hugo into Frere's jail cell he unknowingly sets the stage for Frere's final meltdown. Redgrave's use of his voice during this scene is brilliant. From his gasp of dread when he first sees Hugo to the tortured sounds he makes as he kicks Hugo's head into a pile of sawdust he shows us his madness but also his horrible pain. This episode, like "The Haunted Mirror", is about loss of self. But now the monster is quite literally, us. The similarities to Psycho, considered by many to be the first modern horror film are striking. The dual personalities in conflict, with the transformation twist in the end were used in Dead of Night 15 years before Alfred Hitchcock's masterpiece. While it would have been easy to go out on this extremely high note, the resolution of the wraparound story raises the bar even higher. After Foley's lights dim because of a faulty generator Craig cryptically says, "It's started." Left alone with Dr. Von Straaten, Craig, his will power gone, strangles him with his necktie. With the gatekeeper of logic and science removed, the action goes wonderfully mad. Craig tries to hide but finds himself at Sally's Christmas party, then with Peter in front of the haunted mirror which now contains Von Straaten's body, then at the nightclub at a table with Sylvester Kee and Hugo. The patrons are now a zombie-fied mob that descends on Craig, hurling him into a prison cell. Then, in one of the single scariest moments in horror, a larger version of Hugo, who is also in the cell, slowly gets up and walks to Craig. As the zombies peer through the cell bars, Hugo begins to strangle Craig. The scene cuts to Craig in bed with his hands wrapped around his own neck while the phone rings. It seems that it really was "just a dream". But on the phone is Elliot Foley, introducing himself and the reconstruction job at his country home. Craig has already forgotten the details but as the smoke rises from his just lit cigarette his wife comments that a weekend in the country will help get rid of "those horrible nightmares". At this moment the film goes into slow motion for just a few seconds and we see Craig's face register the first glimmer of unease. The film ends with the credits running over the identical footage of Craig driving up to Foley's house that we saw at the start of the picture. The light traveling music from the introduction has been replaced with an ominous orchestral theme. The implication is that Walter Craig is in a never ending nightmare loop. There is no happy ending-like return to a normal state; that in fact within this reality madness is the repeated end result. The fact that we now know what lies in store for Walter Craig and that he won't know until it is too late adds a fatalistic layer that had never happened in genre films before Dead of Night. Countless horror anthologies have appeared in the years since the release of Dead of Night. Precious few of them match this film's ability to entertain, engage, and disturb an audience. It is not only one of the best films of its era; it is clearly ahead of its time. It can be argued that, taking into account "The Haunted Mirror", "The Ventriloquist Dummy", and the concluding segment of the wrap around story, that the modern horror film begins not at the Bates Motel but in a crowded living room at Elliot Foley's farm. Submitted by Brendan (not verified) on Wed, 2011-02-02 21:34. I was there at the Film Society of the Lincoln Center's screening (which happened around the same time as this), and I completely agree with your review. Though parts of the film were certainly 'misses' (the Golfers? Really?) most of the film was just fantastic. Wonderfully atmospheric. Really eerie. Dead of Night should really be hailed higher than it is. Submitted by Rich Dishman on Thu, 2011-02-03 07:30. Thank you for the comments. Can you tell me exactly when the Lincoln Center showing took place? I would love to have seen this movie on a big screen. Submitted by Brendan (not verified) on Sun, 2011-02-06 21:15. Hm... if memory serves I saw it October 30th, right before Carrie and an Australian movie called The Triangle. It was wonderful. Evidently Film Society of the Lincoln Center does scary-movie-centric programming in the later half of October every year. I only caught those three, but it went on for several days with some really great films (contemporary and classic). I'm definitely attending again next year, and hoping to see more. Submitted by Wayne (not verified) on Mon, 2011-02-07 06:34. Submitted by Rich Dishman on Mon, 2011-02-07 07:15. Thank you. I will have to check this event out in greater detail. Submitted by Brendan (not verified) on Mon, 2011-02-07 16:55. Yeah, man it's totally worth it! I just found the promotional flyer in my room, and from the 27th to the 31st they showed: The Mutations, Legend of Hell House, Stake Land, Hellraiser, The Clinic, Dr. Terror's House of Horrors, Village of Shadows, Black Death, Messiah of Evil, The Creeping Flesh, and The Loved Ones, PLUS the ones mentioned above. Submitted by Robert (not verified) on Thu, 2011-04-28 18:48. Excellent commentary. 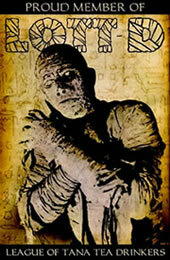 Quite a good movie for its time, and worthy of a remake. I agree the Golf Story doesn't fit. Also, the Christmas Party segment doesn't quite work which seems to drag to its end. Incidentally, Sally looked familiar, then I recognized her - Truly Scrumptious (Chitty Chitty Bang Bang). Submitted by Rich Dishman on Thu, 2011-05-26 09:04. Thanks for the comments. I completely missed the Chitty Chitty Bang Bang boat, but my kids know exactly who T. Scrumptious is. A remake would be mighty interesting, albeit very challenging.